We are making a magical pair of hand-sewn ruby slippers in US women's size 12 for a lady who will be playing Dorothy on stage for the very last time. This is going to be a big pair of ruby slippers for a tall girl, now 30 years old after she started performing on stage as Dorothy at the young age of 12. It has been a long journey and she will go out with a bang with an authentic pair of ruby slippers in the year of the 80th anniversary of "The Wizard of Oz", and it's time for the new generation of girls to perform as Dorothy. 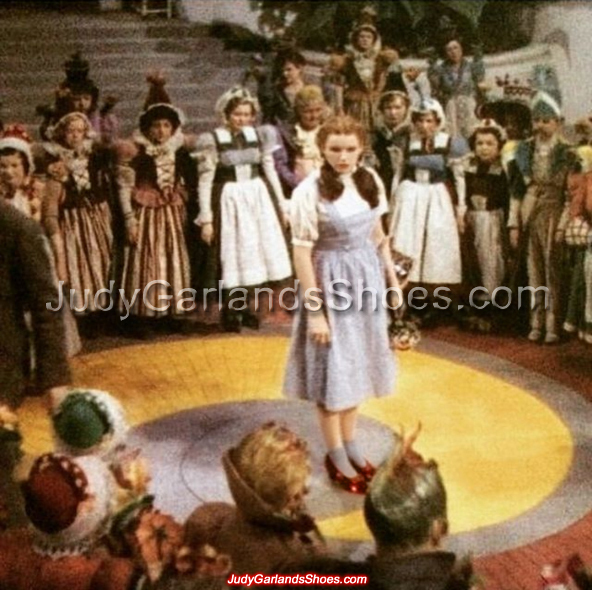 We are excited and grateful for the opportunity to craft a high quality pair of ruby slippers for Dorothy. Below is a rare behind-the-scenes photo of screen princess Judy Garland as Dorothy on the Munchkinland set of The Wizard of Oz (1939). 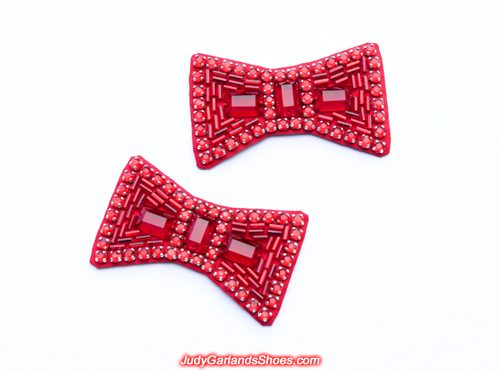 An exquisite pair of hand-sewn ruby slipper bows for this project. 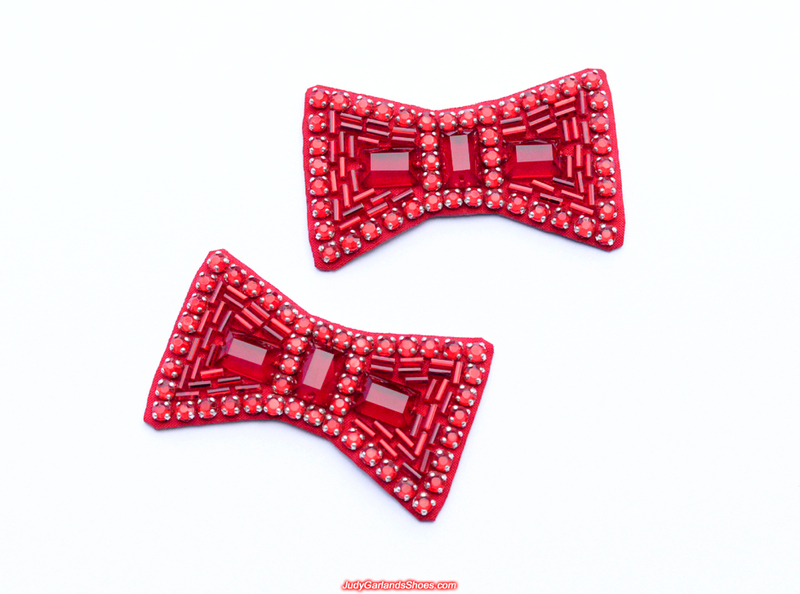 You are looking at a top quality, authentic-looking pair of ruby slipper bows made from silk fabric mounted on a thin piece of bow-shaped leather. The rectangular glass stones with the "V" cuts on the sides, bugle beads and rhinestones with rounded prongs match the original materials. All the materials are sewn by hand with needle and thread. These bows are bigger than the ones found on the original ruby slippers because we are crafting a big pair of ruby slippers in US women's size 12 and therefore the bows need to be compatible. We are leaving this project temporarily but the ruby slippers will be finished by the deadline for Dorothy's performance. We would like to give you an update on the latest development with this project. We have decided to abandon our work with this pair of size 12 ruby slippers for Dorothy and move on and process other orders due to non-payment by the customer. It is important to note that we have been very kind and have made several attempts over the past 5 months to inform her to follow through on our agreement, but have not succeeded. Unless we arrange a new agreement, this pair of ruby slippers will not be finished and the project ends here. 2019 is a busy year for us with ruby slipper orders because of the 80th anniversary of The Wizard of Oz film release (1939).